Heads Up! This issue wasn’t part of our previous 2-issue subscription bundle… This is your FIRST chance to order! Here’s a Taste of What’s Inside! ⭑ Meal-Prep Mania: Mix & Match Recipes - 5 entrees x 7 sides = 35 make-ahead meal possibilities! ⭑ Portion Control Made Easy - A visual reference guide to realistic servings of everyday foods! ⭑ Success with Hungry Girl - See how three fans lost a total of 362 pounds! ⭑ Your Ultimate Dining-Out Guide - Learn how to make the smartest food choices WHEREVER you go. 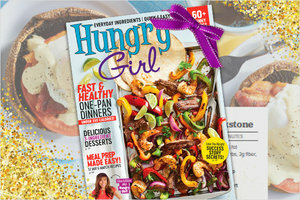 Give the Gift of Hungry Girl! Prefer a Digital Copy? You Got it! You can order 2018's Spring and Summer issues from Barnes & Noble and access them via your Nook tablet or the free Nook app (which works on tons of devices)! Spring 2019 will be available soon.